For over a decade now, our mantra has been “more cocoa, less sugar”. This will never change. Many chocolate manufacturers load their chocolate with cheap sugar. In fact, most mainstream “chocolate” contains more sugar than cocoa, leaving you feeling sluggish, depleted and unsatisfied. Flip it over and check the ingredients – if sugar is listed first, it’s not chocolate, it’s confectionery. Sugar is 10 times cheaper than cocoa. It masks the taste of cheap or old cocoa beans. 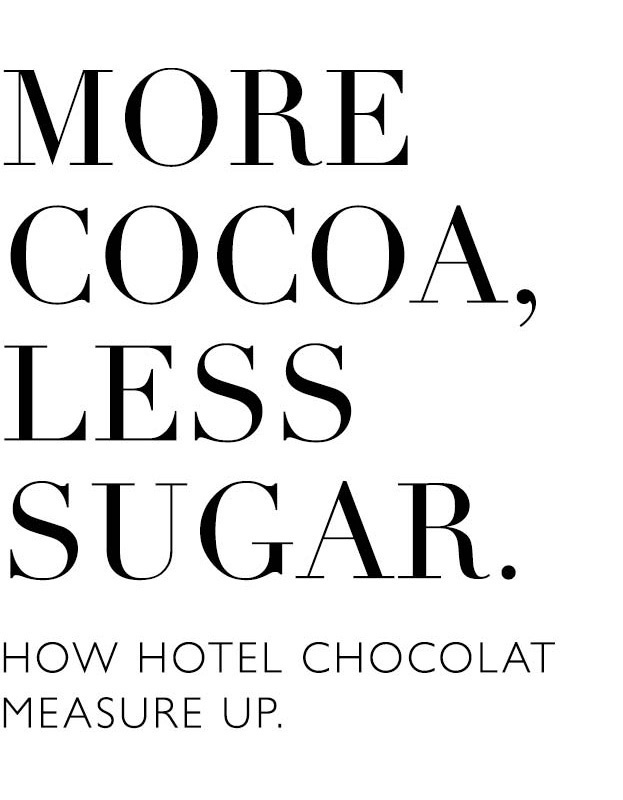 What does “more cocoa, less sugar” actually mean? It means that in our chocolate, cocoa is the lead ingredient. It means that our chocolate presses your pleasure receptors and ultimately, it tastes better. It means that our chocolate is packed with powerful cocoa fuel for your body, rather than empty sugar calories, so satisfies with less. It means that the smooth, creamy flavour lingers on while the cocoa makes you feel focused, energised and on top of the world. Eating chocolate should be a beautiful and pure experience. It’s how the name Hotel Chocolat originated. Aspirational and luxurious, it expresses the power that chocolate has to lift you out of your current mood and take you to a better place. All chocolate makers are having to respond to lower sugar guidelines, but it’s disappointing that the most common way of doing this seems to be just reducing the size of products, rather than going back to making real chocolate again instead of sugar-laced confectionery. Watch this space as we continue to produce more exciting lines that celebrate the superpowers of cocoa in all grades of chocolates, paring back the sugar and exalting the cocoa bean.